Here's todays puzzle piece. 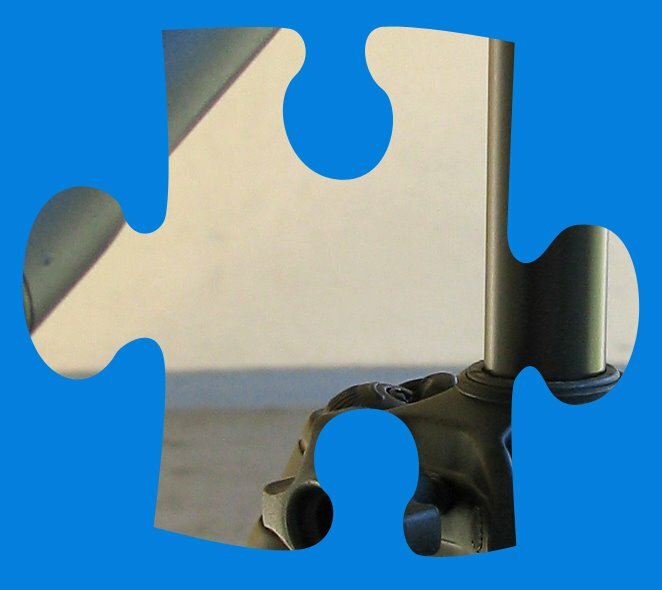 From this small piece you must guess the subject of the entire picture. Don't be shy about guessing. You have until Sunday night to make your guess. On Monday morning I will post the answer and all those who guessed correctly will have a link over on the right for a week. Comment moderation is turned on to keep the guesses secret. What is a triopod, Alex ? Looks like a desk chair. Ok, you got me. I'll sucker into saying its a tripod. That could be a sort of a "foot", jalusta in Finnish, upon which you put your camera when you take pictures by night (for instance), in order to have a steady hand. I'm sorry, it's too early in the morning for me to remember the exact word for it in English. i can bet this is your tripod. el coche del bebe... ¿? I think it's the rotor of a helicopter.